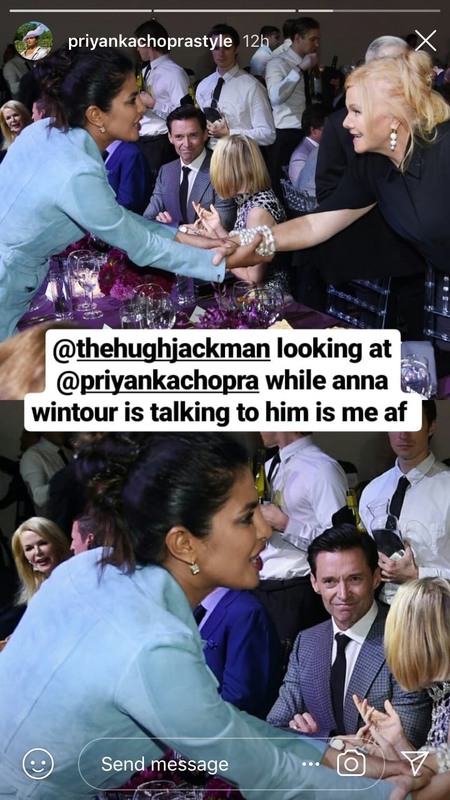 Hugh Jackman Staring At Priyanka Chopra While In A Conversation With Anna Wintour Is A Meme In The Making! We all had our share of laughs and memes made out of the 'Distracted Boyfriend' meme that went viral last year. Not one person spared the meme from relating it to life situations. And looks like the meme is repeating itself yet again! Only this time, it has real-life celebrities playing the respective parts! During the Golden Heart Awards that took place earlier this week in NYC, Priyanka Chopra attended the soiree looking her fashionable best. Perhaps that's what caught Hugh Jackman's attention, who was engaged in a conversation with Anna Wintour. The Instagram account of Priyanka Chopra Style managed to catch this moment and put it up on their Insta story. While Priyanka was greeting one of the folks at the party, Jackman, who was sitting with Anna Wintour, had all eyes on PeeCee! We can forget the 'distracted man' meme and put this picture as the new face of the same meme, what do you guys say? Well, you can check out the picture below and then perhaps give your thoughts on it! For the event, Priyanka donned minimal Michael Kors denim dress with strappy Ferragamo sandals and a tiny shiny Gucci bag. Well, when you look so good and style so perfectly, you'd obviously steal the attention of everyone around! No wonder the X-Men actor couldn't stop himself from being distracted by her! 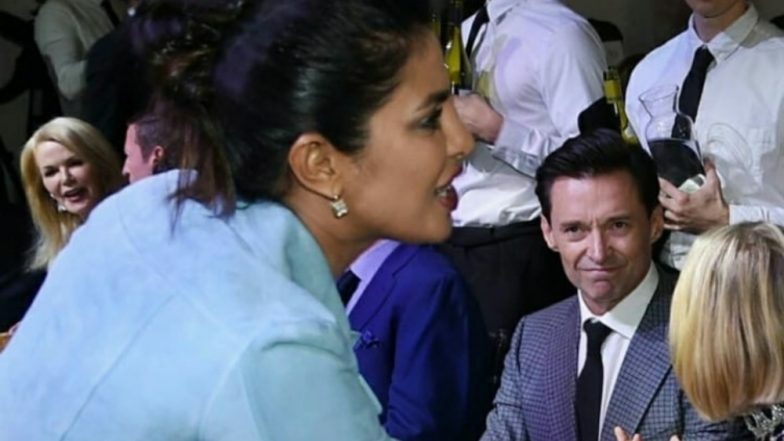 You must know that this is not the first time Jackman is seeing or meeting Priyanka. The duo got acquainted with each other courtesy the NYC Global Citizen festival for which they were hosting segments. They hit it off quiite well with crazy backstage selfies! Jackman's wife Deborra-Lee Furness was also part of their selfie streak.